"Lalla Essaydi's exquisite photographic narratives paired with the inventive and artful paper wigs, in conjunction with Pfizenmaier's vintage fashion photographs present a triumvirate of the exotic side of fashion, from Essaydi’s use of neo-orientalism of Ingres to the present day with PaperCut-Project," said Anna Walker Skillman, owner of Jackson Fine Art and curator of the show. "This is the very first gallery exhibition for these exquisite paper wig sculptures that have become a fixture in the popular press and now the runway." Amy Flurry and Nikki Salk of Paper-Cut-Project are Atlanta-based artists whose innovative paper wig sculptures have captured the imaginations of fashion’s most illustrious houses. In 2010 their debut collection of paper wigs was featured as an installation in the Atlanta and New York locations of Jeffrey boutique. The work attracted Hermès, who commissioned a 30-piece collection of masks for boutique openings in Europe and Asia. With private commissions and installations for Cartier, Kate Spade and The Bay, the team has forged a unique nexus at the intersection of fine art and fashion. “We are thrilled to be presenting Paper-Cut-Project’s work in the gallery for the first time,” says Skillman. Photographs by Greg Lotus of the exclusive PaperCut-Project collection for Italian Vogue –underwritten by Jackson Fine Art- underscore the extent to which these paper works have found currency in the media and how the sculptures have become widely disseminated. Lotus’ work can be found regularly in the pages of Italian Vogue, Vanity Fair, GQ and W Magazine. 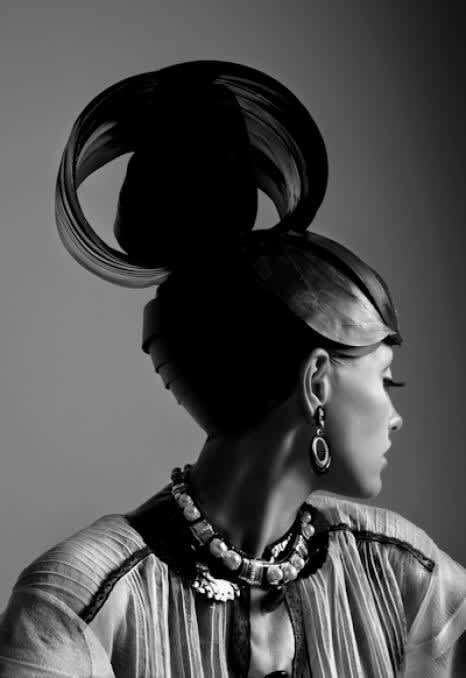 As the paper sculpture wigs are inspired from fashion of an earlier time, Jackson Fine Art is complementing the wigs by exhibiting vintage fashion photographs from the 1960’s by Ed Pfizenmaier.